>> "CREATIVE LIVING," UTILIZING TODAY'S TECHNOLOGY WITH THE BEST OF THE PAST TO BRING YOU INNOVATIVE IDEAS AND UP-TO-DATE INFORMATION FOR CREATIVE LIFESTYLES IN TODAY'S ACTIVE WORLD, WITH YOUR HOST, SHERYL BORDEN. >> I'M SO GLAD YOU JOINED ME TODAY FOR "CREATIVE LIVING." WE'RE GOING TO LEARN HOW TO MAKE A BIRTHDAY GIFT-CARD HOLDER, CREATE A MINI-ALBUM THAT PROVIDES MAXIMUM FUN, AND DEMONSTRATE SOME CLEVER 90-MINUTE QUILT TECHNIQUES. ONE OF MY GUESTS IS LISA ROJAS, AND SHE'S A MIXED-MEDIA ARTIST AND DESIGNER. LISA'S GOING TO DEMONSTRATE USING A BIG SHOT CUTTING MACHINE TO MAKE A BIRTHDAY GIFT-CARD HOLDER. THEN SHE'LL DECORATE IT WITH RUBBER STAMPS AND STICKERS. HER BUSINESS IS CALLED STAMPIN' QUEEN CREATIONS, AND SHE LIVES IN VICTORVILLE, CALIFORNIA. MINI-ALBUMS EQUAL MAXIMUM FUN. THEY ALSO MAKE A GREAT GIFT OR A UNIQUE KEEPSAKE OF A SPECIAL EVENT, A TRIP, OR EVEN A SPECIAL PERSON. ONE OF MY GUESTS IS KRISTINE WIDTFELDT, AND SHE'S GOING TO SHOW HOW TO CREATE YOUR OWN ECLECTIC ALBUM USING A VARIETY OF SHAPES AND SIZES OF PAPER. KRISTINE IS WITH CLOSE TO MY HEART AND LIVES IN PLEASANT GROVE, UTAH. 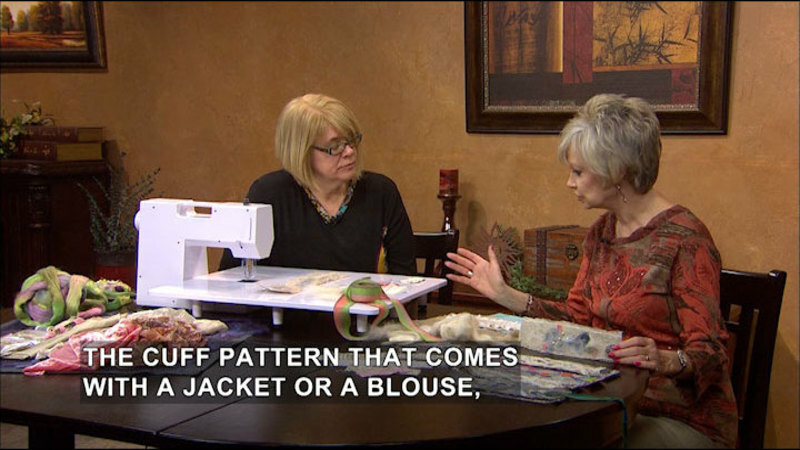 AND WE'LL BEGIN THE SHOW WITH MERYL ANN BUTLER, WHO IS AN AUTHOR AND QUILTER. MERYL ANN IS GOING TO DEMONSTRATE SOME CLEVER TIMESAVERS FOR QUILTING, AND THEY'RE ALL BASED ON HER 90-MINUTE QUILT TECHNIQUE. SHE'S FROM NORFOLK, VIRGINIA. MERYL ANN, IT'S SO NICE TO HAVE YOU HERE, AND I KNOW YOU LOVE TO QUILT, YOU LOVE TO DO WEARABLE ART, SUCH AS YOUR VEST, AND YOU CONTINUE TO COME UP WITH TIMESAVING TECHNIQUES, DON'T YOU? >> I LOVE TIME-SAVING. I LOVE TO BE EFFICIENT. >> UH-HUH. WELL, AND I THINK SOMETIMES IT'S ORGANIZATION, SOMETIMES IT'S HAVING THE RIGHT TOOLS TO DO WHATEVER THE PROJECT IS. BUT IF YOU'VE GOT STEP-BY-STEP, TO ME THAT'S WHAT MAKES IT EASY TO DO. SO LET'S GO AHEAD AND TALK ABOUT THE FIRST TIP THAT YOU'RE GOING TO SHARE. >> OK. WELL, IN MY NEW BOOK, "MORE 90-MINUTE QUILTS," ONE OF THE THINGS I SHOW IS HOW TO MAKE STRIPES WORK FOR YOU. AND THIS IS A STRIPED FABRIC. IT'S BY YOLANDA FUNDORA. >> OH, IT'S KIND OF A... >> IT'S CALLED TWINKLE. IT'S GOT 4 STRIPES ON IT, AND SO I USE THIS FABRIC IN THE QUILT DANISH DELIGHT, WHICH WE'LL SHOW RIGHT NOW IN THE PICTURE. AND THESE ARE SOME OF THE STRIPS THAT I CUT. >> I SEE. THIS IS THE SAME. >> YEAH, IT'S THE SAME GROUP. IT COMES IN DIFFERENT COLORS. AND I USED, IN THE DANISH DELIGHT, I USED THE BROWN AND THE GRAY TO GIVE IT A LITTLE MORE OF A MATURE LOOK. YOU KNOW, BRIGHT COLORS ARE MORE JUVENILE. AND THIS GIVES... >> IT'S MORE SUBTLE. >> THAT'S RIGHT. SO WE'LL SHOW-- AND LET'S MOVE THIS ONE, AND I CAN SHOW THIS. SO THESE HAVE THE LIGHT VALUES. >> AT THE BOTTOM. UH-HUH. >> ONE THING THAT'S GOOD FOR QUILTERS TO KNOW IS ABOUT VALUES. BUT TO MAKE THE QUILT LOOK MORE COMPLEX AFTER I CUT THESE STRIPES, ALL I DID WAS REVERSE EVERY OTHER ONE-- AND WE CAN REVERSE THAT-- AND THEN YOU HAVE LIGHT AND DARK, LIGHT AND DARK, AND IT MAKES IT LOOK MORE COMPLEX. >> I SEE. >> AND THAT'S IN DANISH... THE QUILT DANISH DELIGHT. 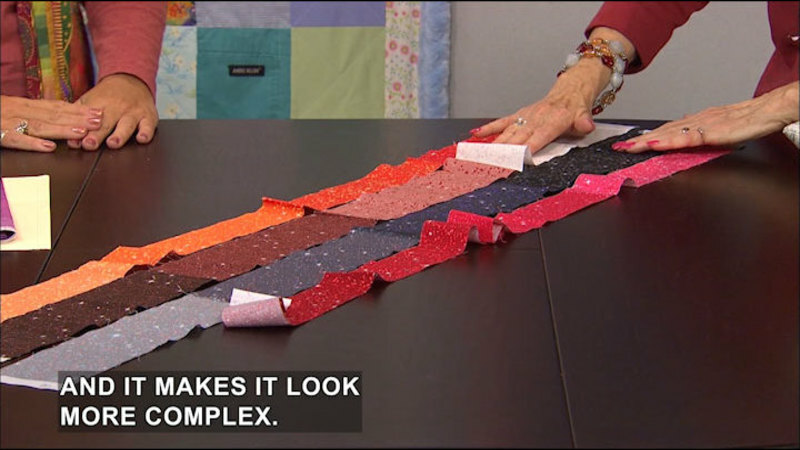 IT'S A LAP QUILT THAT'S MADE FROM 27 PIECES OF FABRIC. >> WOW. OK. >> SO THAT'S ONE WAY THAT STRIPES CAN WORK FOR YOU. AND WE HAVE ANOTHER ONE HERE. THIS QUILT IS CALLED THE FAUX RAIL FENCE QUILT, AND THIS IS FROM MY FIRST BOOK. >> I'VE HEARD OF THE RAIL FENCE QUILT PATTERN. >> WELL, THE RAIL FENCE IS 3 PIECES OF FABRIC SEWN TOGETHER IN EACH SQUARE. BUT WHAT I DID WAS I FOUND STRIPED FABRIC AGAIN, ALSO BY YOLANDA FUNDORA. THIS ONE'S A LITTLE OLDER FABRIC, AND I MADE A LITTLE TEMPLATE SO I COULD SEE WHAT IT WOULD LOOK LIKE. >> OH, AS A SQUARE. >> YEAH. AND SO HERE WE HAVE WHAT LOOKS LIKE 3 STRIPES OF FABRIC SEWN TOGETHER. SO I JUST CUT SQUARES. >> WONDERFUL. YOU KNOW, I'VE NEVER THOUGHT ABOUT LOOKING FOR FABRIC IN TERMS OF IT BEING THE DESIGN. >> THAT'S RIGHT. LETTING IT WORK FOR YOU, DO THE LEGWORK. THAT'S RIGHT. THE NEXT QUILT WE HAVE TO SHOW WITH STRIPES IS THE SONGBIRD WHEELCHAIR QUILT. WE HAVE A PICTURE OF IT IN THE WHEELCHAIR. AND I HAVE IT RIGHT HERE. THIS IS A WONDERFUL COMMUNITY-SERVICE PROJECT FOR QUILT GROUPS. AND THIS QUILT ALSO MAKES STRIPES WORK FOR YOU. THIS IS FLANNEL. AND I DO HAVE A WHOLE SECTION IN THE BOOK ON WHEELCHAIR QUILTS. THIS HAS NO BATTING BECAUSE A LOT OF PEOPLE-- >> YOU DON'T WANT IT THICK, DO YOU, OR TOO HEAVY? >> A LOT OF PEOPLE IN WHEELCHAIRS HAVE CIRCULATION ISSUES. >> I SEE. THAT'S A GOOD POINT. >> SO LINE THE BACK WITH SILK NOIL, WHICH IS OFTEN CALLED RAW SILK. AND IF YOU WASH IT FIRST AND DRY IT, YOU CAN WASH IT FOREVER. >> SO WE SHOULD DO THAT WITH THE RAW SILK. >> YES. AND I JUST USED FLANNEL ON THE TOP, AND THE RAW SILK WILL KEEP IT FROM SLIPPING OFF THEIR LAP, TOO. 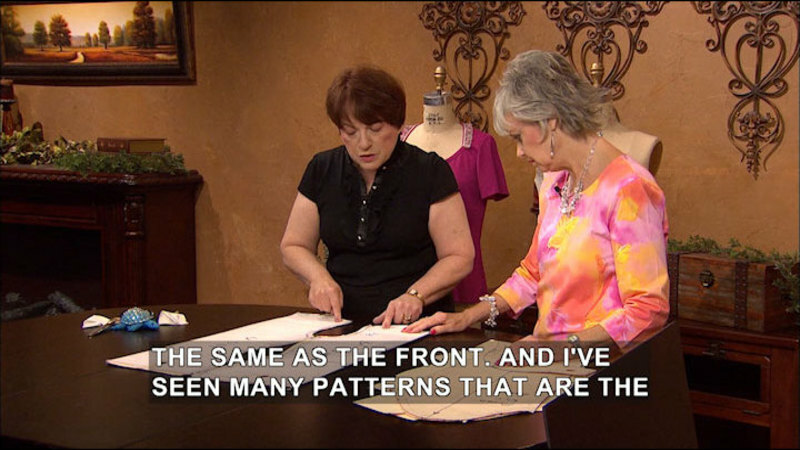 >> NOW, DO YOU TEND TO BUY ALL OF YOUR FABRICS AT ONE TIME, OR HOW DO YOU GO ABOUT, LIKE... I KNOW THESE ALL HAVE SIMILAR COLORS. >> YEAH, THIS PARTICULAR ONE IS THIS SET CALLED THE SONGBIRD. IT'S BY RILEY BLAKE. AND YOU KNOW, IT'S EASY TO MAKE THE COLORS GO TOGETHER IF YOU JUST BUY A FEW COORDINATES IN THE SET. >> I LIKE THAT IDEA, TOO. >> AND THAT WAS QUICK. SO ANOTHER QUICK AND EASY TECHNIQUE IS MAKING A 4-PATCH FLOWER CENTER, AND THE NEXT QUILT IS CALLED MAGICAL MEADOWS, AND YOU'LL NOTICE THAT'S A REGULAR 90-MINUTE QUILT. IT'S GOT 35 SQUARES. BUT THE CENTER SQUARE IS A LITTLE INTERESTING. >> AND THAT'S THE ONE YOU REALLY WANT TO BE EYE-CATCHING. >> THAT'S RIGHT. I LIKE TO FOCUS ON THE CENTER. THIS WAS THE FABRIC THAT I STARTED WITH, AND WHAT I WANTED IN THE CENTER WAS A FULL FLOWER. >> AND THESE ARE, LIKE, HALF FLOWERS. >> BUT THESE DON'T HAVE--YEAH. >> I SEE. >> SO WHAT I DID WAS I USED MY RULER TO CUT A QUARTER OF A SQUARE WITH...OUT OF THIS FABRIC. >> OK. >> SO THEN WE PUT THAT TOGETHER. THESE TWO HAVE ALREADY BEEN SEWN, AND THIS SHOWS WHAT THAT SIDE... ONCE THIS IS SEWN HERE WITH THAT QUARTER-INCH SEAM, IT'LL BE A LITTLE CLOSER. >> I SEE. AND YOU'VE CREATED A FLOWER HERE. >> THAT'S RIGHT. AND THIS IS A LITTLE LARGER THAN WHAT YOU NEED. SO WHAT YOU DO IS, AFTER YOU'VE SEWN THIS TOGETHER, YOU USE A ROTATING MAT-- >> I'VE NEVER EVEN HEARD OF THIS. SO THIS ROTATES. >> THIS IS CALLED THE BROOKLYN REVOLVER. HA HA HA! OK? >> SOUNDS LIKE A GUN. >> IT'S MADE BY MY FRIEND PAT YAMIN. BUT YOU CAN TURN IT AROUND. INSTEAD OF TURNING YOUR BODY AROUND EVERY WHICH WAY-- >> LIKE A LAZY SUSAN. >> THAT'S RIGHT. YOU JUST DO... AND IT'S REALLY QUICK AND EASY. AND YOU'LL PROBABLY SAVE YOUR CHIROPRACTOR BILLS, TOO. >> OK. THAT'S ALWAYS HELPFUL. >> YEAH. HA HA HA. >> SO YOU JUST CREATED USING THAT SAME-- SO EVERYTHING MATCHED, YOU JUST CREATED YOUR OWN CENTER. >> THAT'S RIGHT. >> I LIKE THAT IDEA. >> NOW, THE SAME 4 CENTERS I SHOWED YOU-- THIS BOOK'S IN MY FIRST-- THIS PILLOW IS IN MY FIRST BOOK, AND IT'S THE SAME IDEA, EXCEPT THEY'RE BIGGER PIECES. THESE ARE 6-INCH PIECES. >> SO THE SQUARES CAN BE ANY SIZE YOU WANT THEM TO BE. >> THAT'S RIGHT. BUT WHEN YOU'VE CUT THEM ALL THE SAME, THEY CREATE A KALEIDOSCOPIC DESIGN. >> THAT IS JUST BEAUTIFUL. >> THANK YOU. >> OK. WELL, THE TIME-SAVING TIPS AND THE TOOLS ARE JUST AMAZING. BUT NOW YOU DO HAVE A PRESSER FOOT THAT... THAT HAS HELPED. >> YES. THIS...THE EVEN-FEED... THE WALKING FOOT MAKES IT QUICK. >> IT'S CALLED A WALKING FOOT? >> YEAH, AND IT MAKES IT A LOT EASIER TO STITCH. FOR INSTANCE, LIKE, ON THIS QUILT, WHICH IS MADE FROM BLUE JEANS... >> OK. >> IT'S A LITTLE TRICKY TO STITCH ON THAT. >> BECAUSE OF THE DIFFERENT WEIGHTS AND THICKNESSES? >> AND THEN THIS QUILT WAS MADE OUT OF MY MOM'S... MY MOM WAS IN HOSPICE, AND AFTER SHE DIED, I MADE THIS OUT OF HER CLOTHES, AND THERE WAS A MOMENT WHERE SHE POINTED UP TO THE WALL AND SAID, "LOOK AT THAT." AND SHE HADN'T SAID ANYTHING FOR HOURS, AND SHE SAID, "IT'S AN ANGEL." SO I PUT THE ANGEL IN THE UPPER CORNER TO COMMEMORATE THAT. AND WHEN YOU'RE WORKING WITH SOMEONE'S CLOTHING, YOU DO HAVE DIFFERENT THICKNESSES, SO THAT'S WHY THE EVEN-FEED FOOT IS GREAT. >> OK. AND ARE THESE AVAILABLE FOR ALMOST ALL MODELS OF SEWING MACHINES? >> DIFFERENT MACHINES, YES. >> THEY HAVE THEM? OK. WELL, IT'S REALLY NICE TO KNOW, AND I ESPECIALLY LIKE THE WAY YOU'VE INCORPORATED, JUST LIKE THE ANGEL, JUST SOMETHING THAT'S SPECIAL AND PERTINENT TO THAT PERSON OR THAT HELPS YOU TO REMEMBER THEM. QUILTS ARE A WONDERFUL PIECE OF HISTORY. >> THEY ARE, AND THEY DON'T CALL QUILTS COMFORTERS FOR NOTHING. I TAUGHT SOME GIRL SCOUTS HOW TO MAKE QUILTS, AND WE HAVE SOME PICTURES OF THEM WORKING, AND THEY MADE A QUILT FOR A LITTLE BOY WHO WAS 11 WHO WAS GOING THROUGH CHEMOTHERAPY. AND THEN THEY GOT SO INTO IT, AFTER THE HAITI EVENTS, THEY MADE 22 QUILTS IN 2 WEEKS TO SEND TO HAITI. AND THEY ALSO HAVE MADE THEM FOR PROJECT LINUS. WE HAVE A PROJECT LINUS PROJECT IN THE BOOK CALLED "BE HAPPY" AND A COMMUNITY-SERVICE QUILT CHAPTER THAT REALLY ENCOURAGES PEOPLE TO MAKE COMMUNITY-SERVICE PROJECTS. >> WELL, I REALLY DO APPRECIATE YOU BEING HERE AND SHARING ALL OF THESE NEW TIPS AND TECHNIQUES WITH US. >> THANK YOU. >> KRISTINE, THANK YOU SO MUCH FOR BEING WITH US TODAY. I LOVE TO SCRAPBOOK, AND TO ME, THE BIGGER THE BOOK, THE BETTER, BECAUSE I HAVE MORE ROOM TO PUT EVERY PICTURE IN THE WORLD. BUT YOU KNOW, IT IS SORT OF OVERWHELMING, AND A LOT OF PEOPLE, I THINK, DON'T SCRAPBOOK BECAUSE IT JUST LOOKS LIKE IT'S GOING TO BE TOO BIG A PROJECT. >> THAT'S RIGHT. >> YOU'VE GOT A SOLUTION TODAY. >> I DO, AND IT IS MINI-BOOKS. MINI-BOOKS ARE NOT ONLY EASY TO DO, BUT THEY ARE REALLY FUN, AND YOU CAN MAKE THEM EVENT-SPECIFIC. SO IF YOU'VE GOT SOMETHING YOU WANT TO GIVE TO YOUR GRANDMOTHER OR FOR SOMEONE FOR GRADUATION OR TO REMEMBER A SPECIFIC TRIP TO DISNEYLAND, A MINI-BOOK IS A GREAT WAY TO CAPTURE THOSE MEMORIES. AND SO YOU'VE GOT MY MINI-BOOK FOR TODAY. >> I LOVE THIS. THIS IS SO CUTE. >> AND YOU KNOW, THE FUN THING ABOUT THIS IS THAT IT IS ALL MADE WITH SCRAPS. SO THE MINI-BOOK IS THE GREAT WAY TO CLEAR-- I KNOW YOU HAVE SCRAPS. >> USE UP... I NEVER THROW A THING AWAY. >> NONE OF US DO. NONE OF US PAPER-CRAFTERS WANT TO THROW ANYTHING AWAY, BUT YOU CAN SEE ON THE INSIDE OF THIS BOOK, NONE OF THE PIECES ARE BIGGER THAN MORE THAN A FEW INCHES, AND NOTICE HOW ECLECTIC IT IS. THERE'S THIS BRIGHT-GREEN PEAR-COLORED CARD STOCK. I'VE GOT SOME CRANBERRY RED. THERE'S SOME STRIPES. THERE'S SOME BANDANA PRINT. IT IS OK--I'VE GIVING YOU PERMISSION TO MIX AND MATCH AND BE A LITTLE CRAZY. >> THIS IS GREAT. AND LIKE YOU SAY, WE NEVER THROW ANYTHING AWAY. IT MIGHT BE ONE BEAD. THAT WOULD BE GREAT. WE COULD PUT IT ON THIS PAGE. >> THIS IS AN IDEAL PROJECT TO USE UP YOUR SCRAPS. OH, AND THERE'S A FUN LITTLE POCKET THAT WE CAN INCLUDE RIGHT IN THE BACK THERE. >> TO WRITE NOTES ON. >> TO PUT A LITTLE BIT OF EPHEMERA, SOME TICKETS, A LOCK OF HAIR, A FEATHER. WHATEVER YOU WANT CAN SLIP RIGHT IN THERE. >> AND THEN YOU CLOSE IT WITH RIBBON. >> YES. IT HAS A NICE CLOSURE. AND I'LL SHOW YOU HOW TO MAKE THAT, BECAUSE THAT'S PERHAPS ONE OF THE MOST DAUNTING THINGS ABOUT THE PROJECT, AND IT'S A PIECE OF CAKE. YES. SO LET'S...WILL IT BE OK IF I SHOW YOU SOME OF THIS FUN STUFF? >> OH, I CAN'T WAIT. >> HERE ARE THE GUTS OF THE BOOK. NOW, YOU'LL NOTICE THAT WHAT I'VE DONE IS I'VE CUT A LOT OF THESE SHAPES USING A CRICKET, A PERSONAL ELECTRONIC CUTTER FROM A CRICKET, BUT IF YOU DO HAVE A SILHOUETTE, IF YOU HAVE ANOTHER PERSONAL CUTTER, THERE ARE A LOT OF FUN SHAPES. I LIKE THE ARTISTE COLLECTION FROM CLOSE TO MY HEART, BUT YOU CAN USE ANYTHING YOU WANT. LOOK. LOOK AT THIS. I'VE GOT A FILE FOLDER. >> SO DO YOU NORMALLY START WITH THE COVER OR THE INSIDE? >> I START WITH THE SIZE OF THE COVER, BUT I WANT TO SHOW YOU THE GUTS JUST TO SHOW YOU HOW DIFFERENT THEY CAN BE. THIS IS JUST A BASIC BRACKET. LOOK AT THIS. THIS IS A THOUGHT BUBBLE. >> YES. I WOULD NEVER HAVE THOUGHT ABOUT PUTTING THOSE TOGETHER. >> ALL VERY SMALL PIECES. THIS IS A LITTLE TREAT BAG. >> OH, SO YOU COULD PUT A LITTLE TAG IN IT TO PULL OUT. >> ABSOLUTELY. IT MAKES A NICE LITTLE POCKET. AND THERE IS MY POCKET. >> OH, YES. UH-HUH. >> NOW, WHAT I'VE DONE WITH ALL OF THESE IS I'VE FOLDED THEM, SCORED THEM, AND NOTICE THAT NOT ALL OF THEM ARE EVEN SCORED IN THE MIDDLE. SOME OF THEM ARE SCORED VERY ASYMMETRICALLY, AND THAT ADDS TO THE FUN OF THE ALBUM. SO I LIKE TO TAKE, YOU KNOW, 6, 7 DIFFERENT PIECES TO FORM THE INSIDES, ENOUGH TO PUT DIFFERENT PHOTOS, JOURNALING ON, GET THOSE SCORED AND FOLDED, THEN SET THEM ASIDE. >> OK. >> AND I'M GONNA SHOW YOU HOW TO MAKE THE COVER, BECAUSE THE COVER IS PERHAPS THE MOST DAUNTING. YOU'RE GONNA WANT TO JUST TRIM DOWN A VERY BASIC SHAPE. >> AND YOU CAN MAKE IT AS BIG OR AS LITTLE AS YOU WANT. >> YES, YOU CAN. YOU ABSOLUTELY CAN. THE FINISHED SIZE OF THE PIECE THAT I'M WORKING ON IS ABOUT 6" BY 8", BUT YOU CAN MAKE WHATEVER SIZE YOU WANT. THEN I'VE CUT A LINER PAPER ABOUT HALF AN INCH SMALLER TO GO INSIDE. THE REASON I'VE DONE THAT IS THAT IT'S GOING TO HIDE MY CLOSURE, SO EVEN THOUGH THE RIBBON IS REALLY FUNCTIONAL, IT ISN'T VERY PRETTY. SO USING JUST A LITTLE BIT OF MY ADHESIVE-- THIS IS A PERMANENT ADHESIVE-- I'M GONNA PLACE MY RIBBON CLOSURE-- CUT JUST A LENGTH OF RIBBON. FIND THAT MIDDLE. AND ADHERING IT DOWN. >> THAT WAY, YOU DON'T HAVE A FRAYED END STICKING OUT. >> EXACTLY RIGHT. >> UH-HUH. >> AND SEE, NOW THAT'S FUNCTIONAL BUT NOT REAL LOVELY. SO THAT'S WHERE MY LINER PAPER COMES IN. >> UH-HUH. >> WITH JUST A FEW QUICK SWIPES OF MY ADHESIVE... >> UH-HUH. >> I CAN COVER IT. >> EITHER SIDE OF THAT WOULD HAVE BEEN PRETTY. >> REALLY. YEAH. IT'S A DOUBLE-SIDED PATTERN PAPER. NOW I'VE GOT THE COVER FOR MY BOOK. >> I SEE. AND WHO WOULD KNOW-- I THOUGHT MAYBE YOU'D JUST STUCK THAT UNDER A HALF AN INCH. BUT THAT'S MUCH STURDIER. >> AND IT'S MUCH, MUCH STRONGER. AND THEN I CAN STICK A FUN LITTLE INSIDE LINER PIECE. 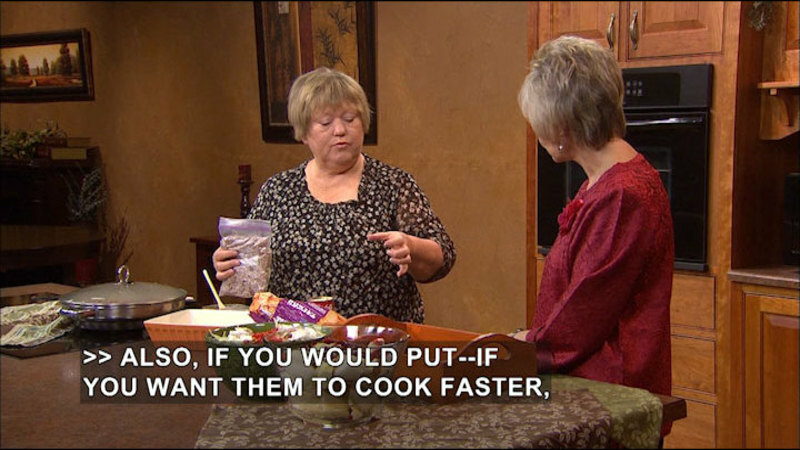 I CAN ALSO PUT THAT LITTLE POUCH INSIDE. AND THEN REALLY I'VE GOT A NICE, FUN WAY TO START BUILDING MY ALBUM. >> SEE, I WOULD HAVE NEVER THOUGHT ABOUT PUTTING-- I'M SO TRADITIONAL, YOU KNOW-- PUT THIS COLOR WITH THAT COLOR AND THAT PATTERN. >> WELL, AND I THINK WE ALL ARE, BUT WHEN IT COMES TO USING YOUR SCRAPS, A GREAT WAY TO USE IT ON A PROJECT THAT IS GONNA MAKE A GORGEOUS GIFT... >> IT IS. >> FOR SOMEBODY. >> SO I'M GONNA SET THIS ASIDE. I'VE GOT ONE THAT'S FINISHED, THAT'S READY FOR ME TO WORK WITH. IT'S A LITTLE BIT DRIER AND SET. NOW WHAT WE'RE GONNA DO IS-- THE BINDING IS PERHAPS WHERE PEOPLE SAY, "HOW DO YOU PUT IT TOGETHER?" IT DOESN'T COME IN A TRADITIONAL ALBUM. THIS IS ALSO SOMETHING THAT'S REALLY FUN TO DO. YOU CAN DO IT WHILE YOU WATCH TV. YOU CAN DO IT IN BED AT NIGHT. IT TAKES ONLY ABOUT 15 MINUTES. YOU'RE GONNA LINE EVERYTHING UP RIGHT ALONG THAT SCORE LINE... >> SURE. >> JUST LIKE THAT. 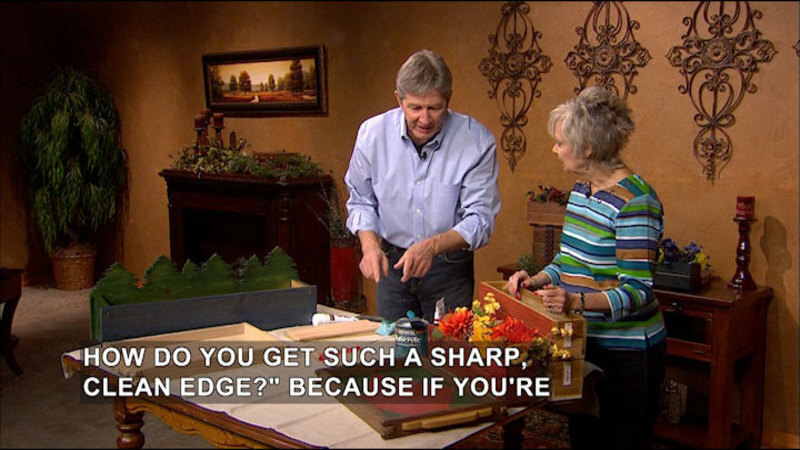 >> THEN I'M GOING TO TAKE A REALLY NICE, STURDY PAPER PIERCER, A REALLY, REALLY SHARP TOOL, AND SOME SORT OF A PIERCING MAT OR A VERSA MAT, SOMETHING THAT HAS GOOD GIVE SO I DON'T-- >> SO YOU CAN GO THROUGH. >> DAMAGE MY SURFACE. >> UH-HUH. >> EXACTLY RIGHT. >> AND THEN I HAVE STRUNG-- I'VE GOT SOME BAKER'S TWINE. >> BAKER'S TWINE. >> REALLY A HOT FUN LITTLE ITEM. COMES IN A BAZILLION DIFFERENT COLORS, BUT IT'S GOT THAT VARIEGATED SWIRL. SO IT'S JUST A LITTLE BIT FANCIER THAN-- >> I'VE NEVER WORKED WITH THAT. >> THAN A NORMAL, LIKE, EMBROIDERY FLOSS. BUT EMBROIDERY FLOSS WILL WORK. >> IT'S STRONGER, TOO. >> IT IS STRONGER. SO I'VE GOT IT DOUBLED UP AND TIED IN A KNOT. YOU'LL WANT IT LONG ENOUGH TO GO...STITCH. AND THEN I'M GOING TO TAKE MY PAPER PIERCER... AND I'M JUST GONNA PUNCH RIGHT THROUGH, WIGGLE IT A BIT, PULL IT OUT, AND STITCH IT RIGHT THERE. >> START FROM THE BACK. >> START FROM THE BACK AND COME FORWARD. YOU CAN START FROM THE FRONT. IT DOESN'T MATTER. >> OH, IT DOESN'T? OH, OK. >> WHEREVER YOU WANT TO HIDE YOUR KNOT. AND PULL IT RIGHT THROUGH. AND THEN--WHOO! CHASE DOWN MY PAPER PIERCER. AND THEN YOU JUST KEEP PUNCHING ABOUT A QUARTER OF AN INCH APART. NOW, WHAT I LIKE TO DO-- INSTEAD OF PUNCHING ALL OF MY HOLES AT ONCE, PUNCH THEM ONE AT A TIME AND THEN STITCH. AND THE REASON FOR THAT IS THAT THE GUTS, ALL THE DIFFERENT PAGES INSIDE, WILL SHIFT JUST A LITTLE BIT. >> YEAH, THAT'S TRUE. AND YOU MIGHT HAVE SOMETHING SLIP. SO ONE AT A TIME, YOU'RE BOUND TO CATCH IT. >> YES. IT WOULD MAKE YOU BONKERS IF YOU TRIED TO ALIGN ALL YOUR STITCHES. SO YOU CAN SEE, THERE'S MY FIRST STITCH. AND JUST IN ABOUT 5 MINUTES, I CAN CREATE A BINDING... >> OH, I SEE. >> THAT'S GONNA LOOK LIKE THAT. AND IT'S REALLY, REALLY DURABLE. AND THEN ALL I HAVE TO DO-- MY BOOK WILL BE DONE. ALL I HAVE TO DO IS MAKE IT MINE. >> OH, THAT'S THE FUN PART. >> IT IS. SO THAT'S WHERE YOU'RE GONNA WANT TO ADD SOME OF YOUR PHOTOS, YOUR JOURNALING, TELL YOUR STORY. >> LITTLE...LITTLE NECK... JUST LITTLE EMBELLISHMENTS. >> WHATEVER IT MAY BE. THERE ARE, YOU KNOW, SOME FUN TICKETS THAT ARE IN HERE FROM A TRAIN RIDE THAT MY FRIEND BECKY TOOK WITH HER SON. WHATEVER YOU ALREADY HAVE IN YOUR STASH. DON'T GO OUT AND PURCHASE A SINGLE THING. YOU ALREADY HAVE STAMP SETS AND TWINE AND STICKERS THAT ARE GONNA BE PERFECT AND ARE GONNA MAKE THIS UNIQUE, ECLECTIC, WONDERFUL TREASURE. >> AND I KNOW, FROM DOING SCRAPBOOKING, LIKE YOU HAVE THE ALPHABET STICKERS HERE, SOMETIMES I WILL HAVE USED UP ALL THE E's ON ONE SET AND ALL THE T's OR SOMETHING. SO SINCE YOU'VE GIVEN US PERMISSION NOW TO MIX AND MATCH, WE CAN USE UP LETTERS FROM ALL THOSE DIFFERENT SETS. >> AND YOU'RE GONNA LOVE THAT ALL YOUR WORDS ARE A LITTLE BIT JUMBLED. THEY DON'T NEED TO BE FROM THE SAME SET. AND YOU'RE GONNA COME AWAY WITH A PROJECT THAT IS AS DARLING AS THIS AND REALLY STURDY. THIS IS GONNA LAST A LIFETIME BECAUSE THAT BAKER'S TWINE IS SO STURDY. >> I THOUGHT YOU WERE PROBABLY GOING TO SAY YOU'D HAVE TO STAPLE THROUGH ALL THAT, BUT THAT WOULD BE SO HARD WITH IT THAT THICK. >> THE TRICK REALLY IS THE POKEY TOOL. THIS PIERCING TOOL IS SO STRONG. >> AND DON'T PUNCH ON YOUR TABLE. >> YES. >> UH-HUH. AND THE RIBBONS AND THINGS ARE JUST AMAZING THAT ARE AVAILABLE ANYMORE. >> THAT'S RIGHT. >> WELL, THIS IS SO FUN. I CAN'T WAIT TO GO HOME NOW AND MAKE 2 OR 3 DOZEN. >> LET'S DO IT. >> OK. THAN YOU VERY MUCH, KRISTINE. >> YOU BET. >> LISA, THANK YOU SO MUCH FOR COMING. I WAS SO GLAD YOU WERE GOING TO SHOW US HOW TO USE THESE DIE-CUTTING MACHINES, BECAUSE THEY ARE REALLY THE RAGE NOW. >> THEY ARE. THEY REALLY ARE. AND THEY'RE SO MUCH FUN BECAUSE THERE ARE SO MANY DIFFERENT DIE CUTS OUT THERE NOW THAT, YOU KNOW, FOR SOMEBODY LIKE ME THAT HAS NO DRAWING ABILITY WHATSOEVER, THEY'RE PERFECT FOR ME. >> WELL, THEY REALLY DO. THEY TAKE A LOT OF THE... LESS FUN OUT OF IT SO YOU CAN DO THE FUN PROJECTS, I THINK. >> RIGHT. RIGHT. >> WELL, THIS IS JUST SO CUTE. THIS IS WHAT YOU'RE GOING TO SHOW US HOW TO MAKE. BUT YOU'RE GOING TO SHOW US HOW TO CHANGE IT. >> YES. >> THIS WAS A SWEET BIRTHDAY, AND THEN YOU OPEN THIS LITTLE THING, AND THERE'S A GIFT CARD IN IT. HOW CLEVER. >> THAT'S A GIFT-CARD HOLDER. >> UH-HUH. >> YES. >> GOSH. THERE'S JUST NO END TO ALL THE LITTLE DECORATIONS-- CUPCAKE AND FLOWERS, AND THEN YOU'VE GOT SOME FOAM BEHIND THESE TO MAKE IT THREE-DIMENSIONAL. >> RIGHT, BECAUSE I WANTED IT TO POP. >> POP. >> YES. >> THIS ONE IS JUST SO CUTE. AND I WAS ALREADY THINKING OF OTHER WAYS, YOU KNOW-- ONCE YOU LOOK AT SOMETHING, YOU CAN THINK OF MORE WAYS TO USE IT. >> OH, OF COURSE. >> SAME IDEA. I MEAN, SAME CUTS AND EVERYTHING. BUT WITH THIS ONE, WE OPEN IT, AND IT'S AN ANNOUNCEMENT, EITHER TO A PARTY OR A BABY SHOWER OR A HOUSEWARMING, WHATEVER. >> I JUST WANTED TO DO SOMETHING A LITTLE BIT DIFFERENT, YOU KNOW, JUST TO SHOW YOU DIFFERENT WAYS ON HOW TO DO IT. >> AND THE MULTITUDE OF SCRAPBOOKING PAPERS THAT ARE AVAILABLE IS JUST PHENOMENAL. >> YES. IT'S AMAZING. AND LET'S TALK ABOUT THESE MACHINES. THIS IS A VERY SIMPLE ONE, ISN'T IT? >> THIS IS A VERY SIMPLE ONE. THIS IS CALLED THE BIG SHOT MACHINE. IT'S ONE OF MY FAVORITES. THE VAGABOND IS ACTUALLY MY TOTAL FAVORITE, BUT... >> BUT IT'S HEAVIER. >> YEAH, IT'S HEAVY. DIDN'T WANT TO BRING THAT ONE. SO I BROUGHT THIS ONE ALONG. AND THE DIE CUT THAT WE'RE GOING TO USE IS A SCOREBOARD DIE CUT. >> SOME OF THEM ARE REALLY BIG. AND LET'S LOOK AT THE OTHER ONE JUST TO SHOW. >> AND THEN THE OTHER ONE IS LIKE THIS. >> WHAT A DIFFERENCE THERE ARE IN THE SIZES... >> RIGHT. >> AND WHAT ALL YOU CAN DO WITH THEM. >> RIGHT. NOW, WITH THESE BIGGER DIE CUTS, YOU REALLY WANT TO USE A HEAVIER PAPER WITH THEM. SO YOU WANT TO USE-- INSTEAD OF USING A, UM... YOU KNOW...WHAT AM I TRYING-- A SCRAPBOOK PAPER... >> YOU'VE ACTUALLY ADHERED IT. >> I'M TRYING TO GET THIS UP. THERE WE GO. YEAH, INSTEAD OF USING YOUR SCRAPBOOK PAPER, YOU WANT TO USE THE SCRAPBOOK PAPER ON A MAT BOARD BECAUSE THE MAT BOARD IS THICKER. >> OH, IT IS. AND THAT WILL CUT-- >> RIGHT THROUGH. JUST THROUGH ANYTHING. YES, IT'S PERFECT. AND THEN WHAT I DID WITH THIS ONE IS I TOOK THE BACKGROUND PAPER, THE PATTERN PAPER, AND I DID IT ON BOTH SIDES ON THIS ONE, BECAUSE I, YOU KNOW, I WANTED TO BE ABLE TO SEE IT ON THE INSIDE ALSO WHEN YOU OPEN THE DOOR. SO I JUST WENT AHEAD AND DID IT ON BOTH SIDES. YEAH. >> THAT MAKES SENSE. >> SO WHAT WE'RE GONNA DO IS WE'RE GOING TO LAY THIS DOWN ON THE MACHINE, AND MAKE SURE THAT YOU COVER YOUR DIE CUT WITH YOUR PAPER. OK? >> AND THEN THESE ARE... THESE JUST CAUSE THE PRESSURE OF THE DIE CUT TO WORK. YOU PUT ONE UNDER AND ONE OVER. >> YEP. YOU'RE GONNA SANDWICH. YOU'RE GONNA SANDWICH IT TOGETHER, AND THEN YOU'RE JUST GONNA... >> ROLL IT THROUGH. >> THERE WE GO. AND BECAUSE YOU ARE WORKING WITH A MAT BOARD, YOU KNOW, IT'S A LITTLE BIT THICKER. SO YOU KNOW, YOU HAVE TO PUT A LITTLE BIT MORE OOMPH BEHIND IT. >> HA HA HA. >> OK. THERE YOU GO. AND THEN THIS IS WHAT YOU-- >> AND IT CUT IT SO WELL, YOU CAN JUST POP IT OUT. >> LET ME SHOW YOU. THIS IS ONE THAT'S ALREADY DONE. >> UH-HUH. >> OK? IT'S ALREADY CUT OUT. YOU CAN SEE. >> ALL IN ONE PIECE. >> ALL IN ONE PIECE. >> YOU DON'T HAVE TO GLUE IT OR DO ANYTHING WITH IT. >> SO, SO SIMPLE. OK. AND THEN THE EASY-- YOU KNOW, I DID THIS VERY SIMPLE. I TOOK A PIECE OF, YOU KNOW, YELLOW CARD STOCK, AND I STAMPED MY INVITATION ON IT. >> YOU SAID YOU LOVE RUBBER STAMPS, DON'T YOU? >> LOVE RUBBER-STAMPING. YOU KNOW, I HAVE TO RUBBER-STAMP IN JUST ABOUT EVERYTHING THAT I DO. YOU KNOW, SOMETIMES I'LL GET AWAY FROM IT, BUT, WELL, I REALLY LIKE IT. >> YOU LOVE IT. >> SO YOU'RE GOING TO ADHERE THIS TO THE INSIDE OF YOUR CARD, YOU KNOW, OR YOUR FRAME HERE. AND THEN THE NEXT THING THAT YOU'RE GONNA DO IS-- WITH MINE, I HAVE THESE... YOU KNOW, THESE CUTE LITTLE STICKERS THAT I HAVE ALL OVER MINE. OK? AND THEN I ALSO HAVE THE LITTLE CANDLES THAT I PUT ON THERE. 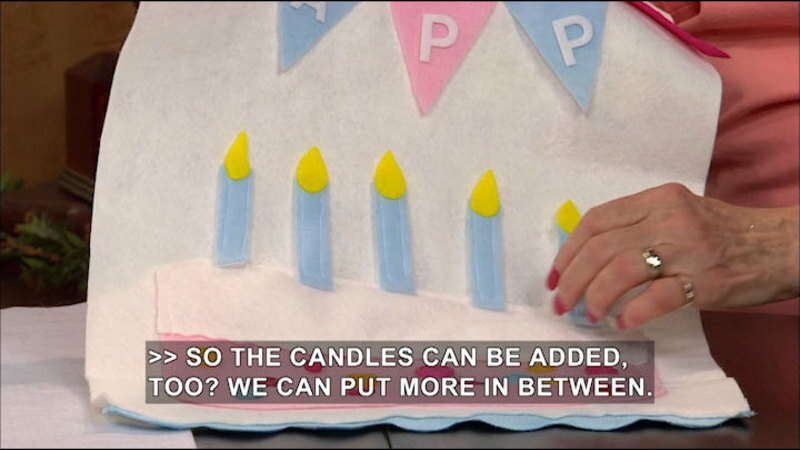 AND THAT'S WHERE THE DIE CUT-- >> YOU CUT THOSE LITTLE, TINY CANDLES. >> I CUT THOSE OUT, YES. AND THAT'S WHAT THESE CAME FROM. >> UH-HUH. >> SO THAT'S WHERE YOU CAN GET THE SMALLER SIZE. OK? AND THEN THE NEXT THING YOU'RE GONNA DO IS YOU'RE GOING TO TAKE YOUR... >> RIBBON. >> YOUR RIBBON HERE. >> I THOUGHT THAT WAS JUST DECORATION, BUT THAT ACTUALLY HAS AN IMPORTANT ROLE. YOU JUST--YOU'RE USING A HOT-GLUE GUN. >> I'M USING A HOT-GLUE GUN, AND I'M JUST GONNA RUN A STRIP DOWN THE CENTER THERE. OK? AND PUT IT ON. >> AND AGAIN, THIS COULD BE-- THIS IS GROSGRAIN RIBBON, BUT YOU COULD USE WHATEVER YOU HAVE LEFT OVER FROM A SEWING PROJECT OR SOMETHING. RICKRACK WOULD BE CUTE, TOO. >> RICKRACK, ANYTHING, YOU KNOW, ANYTHING LIKE THAT. AND YOU KNOW, REUSE, BECAUSE YOU'RE ALWAYS GONNA HAVE LEFTOVER PIECES OF RIBBON FROM YOUR DIFFERENT PROJECTS. >> THAT JUST GOES ALL THE WAY AROUND? >> IT GOES ALL THE WAY AROUND. >> I SEE. UH-HUH. >> ALL THE WAY UP THE BACK. SO VERY SIMPLE. AND THEN THE NEXT THING THAT YOU DO IS YOU JUST TAKE-- >> THIS IS THE FUN PART, I THINK. >> YEAH. WELL... >> EMBELLISHING IT. >> YEAH, BUT WE'RE GONNA DO-- WE'RE GONNA ADD A LITTLE INK. >> OH. >> WE'RE GONNA ADD A LITTLE INK BECAUSE I'M A RUBBER-STAMPER, AND I HAVE TO HAVE MY INK. SO I JUST TAKE MY INK AND JUST KIND OF GO AROUND THE EDGES. >> I HADN'T EVEN NOTICED IT, BUT, YEAH, YOU DID. >> I PROBABLY DID IT IN THE BLUE, I THINK. YEAH. WELL, I DECIDED TO DO IT IN ORANGE THIS TIME. AND THAT'S ALL YOU DO. YOU JUST RUN IT OVER THERE. >> YOU KNOW, THE GOOD THING ABOUT THIS IS IF SOMEONE GOT THIS, THIS WOULD BE A KEEPER. I MEAN, IT WOULDN'T GO IN THE TRASHCAN THE MINUTE THE SHOWER OR THE PARTY, WHATEVER... >> I WOULD HOPE NOT. I WOULD HOPE NOT. I WOULD HOPE THAT SOMEBODY WOULD KEEP IT. AND THEN THE LAST THING THAT YOU'RE GONNA DO IS JUST ADHERE... >> JUST DECORATE IT. >> JUST DECORATE IT. MM-HMM. JUST PUT YOUR LITTLE STICKERS ON THERE AND... >> AND YOU USE A LOT OF THAT FOAM ADHESIVE, WHICH GIVES IT AN ADDITIONAL THREE-DIMENSIONAL... >> YEAH, THESE STICKERS ACTUALLY COME THAT WAY. >> OH, THEY DO? >> YES. SO THEY'RE ALREADY DONE FOR YOU. THE ONLY THING YOU DO IS JUST PEEL OFF THE BACK AND SLAP THEM ON THERE. >> AND THEN YOU ADDED A LITTLE LAVENDER BOW IN THE MIDDLE. >> ADD A LITTLE LAVENDER BOW. AND THAT'S IT. >> WELL, THIS IS SO MUCH FUN, AND, BOY, YOU'RE RIGHT. THESE MACHINES JUST MAKE CUTTING--IT JUST ELIMINATES ALL THAT FUSSY CUTTING WITH AN X-ACTO KNIFE OR SCISSORS OR WHATEVER. >> ESPECIALLY IF YOU CAN'T DRAW. >> YOU'RE RIGHT. WELL, THANK YOU SO MUCH. THESE ARE SUCH CUTE IDEAS. >> GREAT. >> I HOPE YOU ENJOYED THE SHOW TODAY. NEXT TIME ON "CREATIVE LIVING," WE'LL LEARN HOW TO COOK WITH ARTICHOKES AND MAKE SOME FUN FELTING PROJECTS. ONE OF MY NEXT GUESTS IS A COOKBOOK AUTHOR AND CHEF, AND HE'S GOING TO DEMONSTRATE THE ART OF AN ARTICHOKE. MANY PEOPLE ARE HESITANT TO BUY AND ATTEMPT COOKING THIS STRANGE VEGETABLE. HOWEVER, ON THE NEXT SHOW, WE'LL LEARN HOW TO CLEAN AN ARTICHOKE AND HOW TO STEAM-COOK IT IN A PRESSURE COOKER. ANOTHER GUEST WILL SHOW A VARIETY OF FELTED PROJECTS, FROM A SWEATER TO A PILLOW TO SEASONAL DECOR, AND SHE'LL DEMYSTIFY THE CRAFT OF FELTING, WHICH IS ACTUALLY SO EASY. BOTH OF THESE TOPICS WILL BE FEATURED ON THE NEXT "CREATIVE LIVING" SHOW. IF YOU EVER HAVE COMMENTS OR SUGGESTIONS OR IDEAS FOR SHOWS, YOU CAN E-MAIL ME AT sheryl.borden@enmu.edu. I'D ALSO LIKE TO ASK YOU TO BECOME A FAN OF "CREATIVE LIVING" ON FACEBOOK. JUST GO TO FACEBOOK.COM AND IN THE SEARCH WINDOW, TYPE IN "CREATIVE LIVING WITH SHERYL BORDEN." THANKS SO MUCH. I HOPE YOU'LL PLAN TO JOIN ME NEXT TIME FOR "CREATIVE LIVING." >> WE ARE VERY PLEASED TO OFFER A NEW BOOKLET THAT ACCOMPANIES THIS SERIES OF "CREATIVE LIVING." THIS BOOKLET IS TITLED THE 6600 SERIES, AND IT FEATURES A WONDERFUL COLLECTION OF IDEAS AND INFORMATION, AND IT'S AVAILABLE FREE OF CHARGE ON OUR WEBSITE. POSTED AS A "PDF" FILE, YOU CAN SIMPLY DOWNLOAD THE ENTIRE BOOKLET OR JUST THE SEGMENTS YOU'RE MOST INTERESTED IN. AS WITH ALL OF THE "CREATIVE LIVING" BOOKLETS, YOU'LL FIND INFORMATION ON FOODS AND NUTRITION, CLOTHING AND FASHION, HEALTH AND BEAUTY, HOME DECORATING, AND MUCH MORE. FOR YOUR COPY OF THIS BOOKLET, GO TO OUR WEBSITE AT kenw.org AND THEN CLICK ON "CREATIVE LIVING." SCROLL DOWN TO THE BOOKLETS SECTION, AND YOU CAN CLICK ON THIS BOOKLET OR ANY OF THE OTHER BOOKLETS WE HAVE AVAILABLE ONLINE. ONCE AGAIN, JUST GO TO kenw.org, CLICK ON "CREATIVE LIVING," AND DOWNLOAD THE BOOKLET TITLED THE 6600 SERIES. WE ALSO WANT TO ENCOURAGE YOU TO SIGN UP FOR OUR FREE E-NEWSLETTER. JUST CLICK ON THE "SIGN UP NOW" BUTTON AND INPUT YOUR E-MAIL ADDRESS. THAT'S ALL THERE IS TO IT. YOU'LL ENJOY READING AN UP-TO-DATE NEWSLETTER FILLED WITH INTERESTING TOPICS AND INFORMATION. THANK YOU. 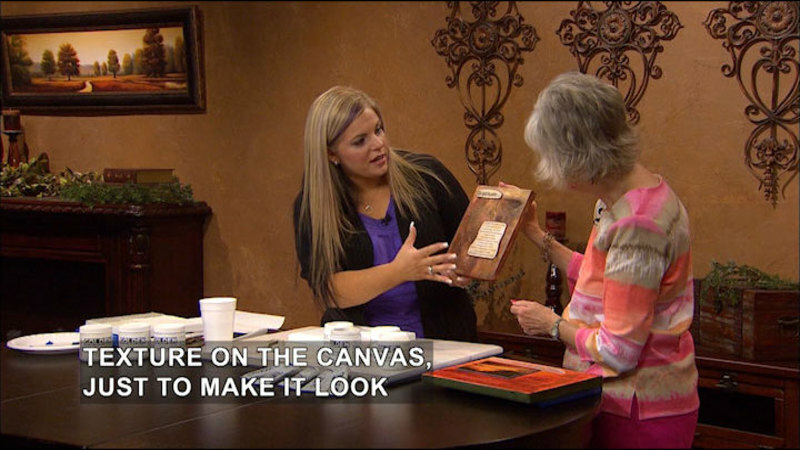 In the crafting section, viewers learn how to create gift card holders and mini albums using mixed media techniques. Author Meryl Ann Butler also gives time saving quilting techniques.